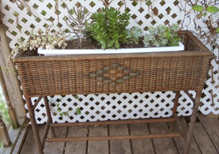 This is actually a very old wicker window box, it's been in my family for three generations. I wondered if I can find out what the plants are, now that I'm more interested in the identification aspect of my collection. I love your old wicker window box - there's something about the old and rustic things that really appeals. The quality of the materials, and the workmanship is superb. The one on the end, sorry I can't see it clearly enough, could be a Pepperomia possibly. The next one, larger upright and spotted is Kalanchoe tubiflora, or Chandelier Plant. Then the one in the center is Crassula, probably Crassula ovata. The smaller blue one is either Echeveria of some kind or even one of the tender Sedum, but I can't tell for sure. Then there is one of my favorites, Crassula perforata, with a small cutting of possibly the larger Crassula listed above in the corner. Lovely planter, and I'm glad to see you have all the plants in a plastic liner to prevent damage to the old wicker. It looks in fantastic shape, so hopefully will have many more years of giving you pleasure and housing your succulent collection.